Description: Not sure of the location. Somewhere between DC and Baltimore on the North East Corridor. Best cab ride ever!! Description: An AEM 7 pokes its nose out from under 9th Av as it rolls through the short stretch of daylight between 9th Av and the North River tunnel entrance with a DC bound train. Dad lived on 34th St off 9th Av, and passed here often. Sometimes hed grab a shot. Description: An eastbound Amtrak train arrives from Washington, passing through the open air segment between 9th Av and the tunnel as it approaches the platforms. Description: There was a short stretch of daylight between the station tracks and the end of the North River tubes, roughly between 9th and 10th Avenues. It provded a small glimpse into the underground life of the city. Dad lived just off 9th Av on 34th St, and came by here often. 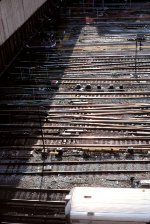 He liked the image of the complicated track pattern-of necessity due to the need to get 21 station tracks into two tracks for the tunnels. Description: TRain 131 breezes into Guilford at 08:22. 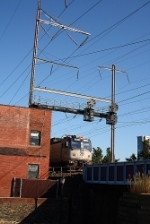 When the power was first turned on east of New Haven, the trains often had double-headed "meatballs. Description: Amtrak clocker heads southbound out of 30th Street Station in Philadelphia headed by toaster 937. Description: The Vermonter is approximately a half hour late passing New Rochelle Station on the last leg of its journey to New York City. Description: Washington-bound Acela Regional passing New Rochelle, NY on June 10, 2005. Description: Train #173 from Boston to Washington switches from Track One to Track Three to make its scheduled stop at New Rochelle. NY on time at 3:15 PM on January 27, 2006. Description: Westbound through Rahway NJ. Description: Two units with three Amfleets demonstrate Harrisburg's need for more locomotives. Note by roof detail that 937 is a standard 'DC' AEM-7, and 944 is an AEM-7AC. Description: Amtrak AEM-7 #937 leads a train through Elizabeth NJ. Description: NJ Transit Arrow III MU Car #1362 heading towards the Elizabeth station. Amtrak AEM-7 #937 is in the distance. Description: Amtrak AEM-7 #937 leads another AEM-7 through Elizabeth NJ passing a stopped NJ Transit Arrow III MU Consist. Description: Amtrak AEM-7 #937 leads Another AEM-7 past the Secaucus Transfer Station on the Northeast Corridor. Description: Amtrak 937 blast past the old signals out of Wilmington Station. Description: Train 86, straight from Richmond, VA, speeds east through Marcus Hook wuth a toaster on the point. Description: Another southbound regional heads through Frankford Junction before 4670 takes it's turn.